Mary will share her enthusiasm for art, bees and community. From the Wired Monk, we’ll walk together to Mary’s traffic circle garden at 6th & Trafalgar, which won the most bee and butterfly friendly garden at last year’s Green Streets celebration. If you’d like to pick some herbs, bring along a little bag to put them in. Picking is encouraged. 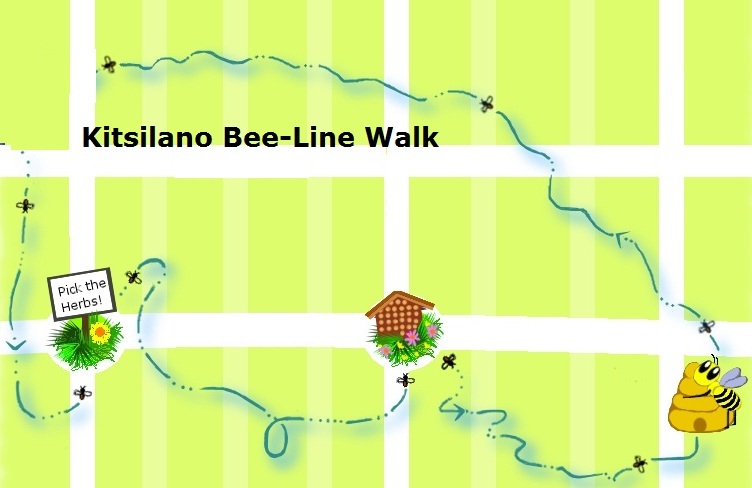 The walk will include other bee-friendly highlights in the neighbourhood. In the meantime, do visit my traffic circle garden at 6th & Trafalgar. I’m part of a group initiating a project in Kits to enhance roundabout gardens for bee and butterfly habitat, community connections and just generally support volunteer gardeners in making their gardens more “unique and creative”. Send me a note to maryinvancouver@gmail, if you’d like to know more about these kinds of initiatives. Click here for the story. Mary’s herb garden, a traffic circle garden at 6th Ave. and Trafalgar St., is one of many personal projects that is greening the city of Vancouver.